In 1997, after a dream trip to Scotland, a drunk driver crashed into the limousine I was in, coming from the airport toward my home. In a few seconds, my world turned into a world filled with pain (from a chronic spinal injury)-until I found Dr. Puppala. He truly has been a miracle for me! My pain has changed so much with the medical procedures that he has done for me. My pain level was regularly a 6 to 9 on the pain scale and now it’s a 0! This is changing my life in so many ways and I’m more than happy to share my success story with anyone. I have lived with chronic pain for years. I’ve gone to other pain management offices that have offered nothing, and I felt like asking for what I needed or telling them how bad I was hurting was a bad thing. I’ve spent my last year in pain management in pain. Dr. Puppala saw me three times, gave me options, listened to me, and actually helped. I’m standing here right now in no pain. Thank you Dr. Puppala and your wonderful staff for your fantastic service. I was awake during my procedure and am now pain free. If I ever need help with back pain again I will return to Dr. Puppala. Dr. Puppala and his staff are awesome! Great experience and no more pain. 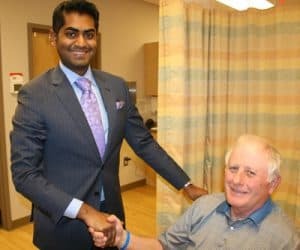 When I first came to see Dr. Puppala I was having headaches so bad that I could hardly see – I even went to the emergency room a few days before my first appointment with him. My first injection was a diagnostic “test” that gave me 60% pain relief. Dr. Puppala has really helped my back pain – he and his staff are amazing. I recently visited Dr. Puppala for a cervical Medial Nerve Branch Block (MBB) injection and the results were almost immediate. I had a 50% pain improvement with only one injection! Prior to seeing Dr. Puppala, I had a spinal chord stimulator implanted in 2013 but it constantly shocked me when I turned it on so I stopped using it. My pain management journey with Dr. Puppala has been fantastic! He changed my stimulator to a different brand and it was the best thing I could have done to control my pain. I now take less medication and my life is much better! My experience at Dr. Puppala’s office has been awesome and everything he has done for me worked 100% every time. Awesome place to have my procedures because everyone makes you feel relaxed and comfortable. Everyone at Dr. Puppala’s office is so nice and helpful! I had a lumbar epidural steroid injection for the first time and I have no pain. I recommend it! I recently received an ablation procedure on my right shoulder after having several nerve block/trigger point injections. The injections really helped but my unique situation called for ablation which lowered my pain 50 – 60% more! I am much more mobile with less pain than ever before! I recommend Dr. Puppala and his techniques to get rid of pain! I had a procedure recently and was not at all nervous because Dr. Puppala explained every single step from beginning to end. I had local anesthesia and felt very little except for a small “jolt” in my arm. There was no pain throughout the procedure which amazed me because I expected the worse. I thank each and every staff member for their time and attention – very professional and attentive. Awesome! My pain level went from a 7 (out of 10) to a 0! I got 100% relief! I was really hurting when I came to see Dr. Puppala – after a short while the injection began to work and I feel so much better! Thanks Dr. Puppala! I was visiting sports medicine doctors, chiropractors, and taking powerful pain medication before I met Dr. Puppala. He performed nerve burns and used epidurals to treat my pain and after two years the pain is gone! Treatment has helped me so much that I can hunt and weld like I did in my 40’s. I am spending more time with my children and grandchildren – at times I am physically stronger than them! I will be 59 this year and I feel great. I came to see Dr. Puppala because the right side of my back was really hurting and very painful. He gave me a “trigger injection”, which did not hurt, and within minutes the pain and pressure was gone. Thanks Dr. Puppala! I had a cervical epidural inserted into my neck area that gave me pain relief for three weeks – what a joy! Usually my pain is 24/7 without any form of relief so I can honestly say that the epidural definitely helps my pain. Dr. Puppala took such good care of me today! e and his entire staff are very nice and genuinely care about my health. My pain level was a six prior to my procedure and within five minutes afterward it was down to a four. When I left the office it was down to a two! Great deal of relief! I absolutely love Dr. Puppala and his staff. My knees and hips feel so much better after my injections and I can actually sleep without pain! As of this month I feel so much better after having spine injections and am capable of spending more time with my grandchildren. I am enjoying my life so much more and I absolutely love the doctors here at the office! I received Dorsal Column Stimulation (DCS) two months ago and other than the pain from the implant, I could tell that the “pulsing” sensation would help me once I completely healed from the procedure. Prior to my DCS implant, I was standing and sitting bent over forward 24/7. Now I am almost sitting and standing normally after 5 1/2 years. I am so very thankful for the DCS devise – thank you! I just recently started visiting Dr. Puppala and so far what a difference! I only wish that I had gone for treatment sooner. I have great hopes that over a period of time my life will change and be pain free. I recommend Dr. Puppala to anyone! This is the first time in over twenty years that I have been pain free. I have so much energy and am very active – I no longer take pain medication. I have been in extreme pain for some time now. I could hardly walk. I’ve had treatments in the past that didn’t work. I had 3 treatments in the past month with Dr. Puppala and I am feeling great! It’s amazing! I don’t know what the difference is, but Dr. Puppla’s treatment was just great! Thank you so much! I feel a lot better than before and it is great not to have pain. Since I have been visiting Dr. Puppala, my pain has improved in ways I never thought would happen. I no longer worry about not being able to play and run around with my children. I am grateful beyond words! I have had pain in my body for over 20 years. The nerves would trigger my bowels and bladder at any time without warning. I have had no pain since I under went treatment from Dr. Puppala using spinal cord stimulation. It is wonderful! I feel like I’m 20 years younger! Other doctors would just fill me with pain pills and muscle relaxers and I walked around like a dope for 20 years and now I am drug free. I have highly recommended everyone there, especially Dr. Puppala. I walked in Dr. Vinaya K. Puppal’s office with tremendous pain in my shoulder. Every time I tried to move it I would moan and groan because it hurt so bad. He gave me shots in the area of my pain and then asked me how it felt. my reply was “how could I know, you just gave me the shots.” Then Dr. Puppala said to start moving your shoulder. I did and couldn’t believe it. Immediate relief! I’m so excited that I can move without pain. Dr. Puppala is probably one of the best doctors I’ve dealt with since all of my problems started! I had one visit with Dr. Puppala for back pain and no pain since then – thanks for giving me relief! I had Radiofrequency Ablation and it helped tremendously. The pain in my back decreased 70% and I am able to walk a lot better since the procedure. I visited Dr. Puppala and had a consistent level 4 – 5 on the pain scale. After the injection my pain greatly improved and was about a level 1. Thanks Dr. Puppala! My back has been hurting for five or six years and I saw multiple doctors with no reduction in pain. I found Dr. Puppala who diagnosed the problem in my back – three days after my procedure I was 100% pain free! After my back pain was gone he worked on my shoulders and neck. Once again, the pain and headaches disappeared after a short while. He worked very diligently to rid me of pain and i could not have made it without him! I received a “trigger point” injection and it helped so much to relieve my pain. Thanks for all you do for me! My recent back injections helped tremendously and I am very thankful to be more mobile with less pain. I recommend these injections to anyone that has back pain. I, Theresa R, was in so much pain, but after the procedure my pain isn’t there. I was a little nervous, but I didn’t feel any pain when Dr. Vin was doing the procedure. Thanks for everything I felt so comfortable and the pleasant feelings with the staff. I recommend everyone to come here. Thanks again. On the morning of April 4th, 2017 I was introduced to Dr. Puppala. I was kind of skeptical of what needed to be done but the doctor explained everything that was going on with me. My pain was a seven on the scale of zero to ten in my lower back. Dr. Puppala assured me there was nothing to worry about. During the injection procedure, I felt a lot of pain and it seemed unbearable but I felt like the staff here walked me through it with encouraging words and professionalism. After the procedure the pain was gone and I’m glad I actually got this procedure done. Thank you to Dr. Puppala and Comprehensive Spine & Pain. Before I found Dr. Puppala I had severe pain on the right side of my face in the mouth area. The pain was the most horrible, stabbing pain I have ever experienced. Dr. Puppala gave me an injection near my right temple and I have been pain free for 14 months. I came back for another injection this month – I am hoping it will last another 14 months. Thanks Dr. Puppala! I have been receiving cervical epidurals for my neck pain for about a year now. I chose local anesthesia to stay awake during the procedure and really didn’t feel anything except a mild “jolt” a few times. After the procedure I had immediate 100% pain relief – words cannot describe what this means to me. Thank you Dr. Puppala for giving my life back to me with no arm pain! I first visited Dr. Puppala about a year ago to start a pain management program, I can honestly say that Dr. Puppala’s treatment plan has allowed me a quality of life I’ve not experienced in many years. I feel better than I have in ten years! Eleven months ago I went to see Dr. Puppala because of severe migraine headache pain. Most of the time the pain was so bad that I was bed ridden up to five days a week. At one point I was taking numerous pain medications for relief, Dr. Puppala’s pain injection treatment plan helped me eliminate most of them and I feel great – I got my life back! I am a huge fan of Dr. Puppala and he has been a blessing in my life, I’m very thankful to be his patient! My experience with Dr. Puppala has been amazing! I am originally from Southern California. As a youth I was a surfer girl and very active but early in life I developed degenerative bone loss in my back which eventually lead to pain in other parts of my body including my knees. In 2003 I was in a minor car accident that affected the alignment of my entire body. My back hurt, my knees hurt and I was miserable! I suffered for many years until I went to see Dr. Puppala, he gave me several injections and non-narcotic medications for the pain – I can now cross my legs for the first time since the 1980’s and I feel great! Dancing with the Stars here I come! Dr. Puppala began a series of injections, RFAs, and epidurals for my lower back this month and it has changed my life. I now live mostly pain free and my walking has gone from a noticeable limp to a normal gait. This has been such a blessing and Dr. Puppala and his staff are gracious, courteous, and dedicated professionals. I will forever be eternally grateful. I am 63 years old and have never felt better. Thank you and God bless! I began having muscle spasms in November and was in a great deal of pain. Getting out of bed was torture. I saw several doctors who kept telling me that I would probably heel with traditional treatment. They sent me to physical therapy and I did the prescribed exercises at home in addition. I still had back pain and could not enjoy physical activity at all. I saw Dr. Puppala in March. He ordered an MRI and found that I had a crack in my spine. He prescribed medication that eased the pain and then began spinal injections. I just finished my third set and feel like myself again. I no longer need any medication. Thank you Dr. Puppala! I have been experiencing back pain for years and at one point my pain began to radiate down my back to the knees and all the way to my toes! I went to see a neurosurgeon who gave me several injections to relieve the pain and I was ok for a while. I even went so far as to lose eighty pounds to help my situation but my sciatica nerve was acting up and causing so much discomfort that I was referred to Dr. Puppala. It took a few treatments but the pain is gone. The last time I visited Dr. Puppala I got a few injections in my lower back to help my bulging disk problem and I feel great. I really like Dr. Puppala and his staff and I am thankful for the relief! I have been disabled for the last fourteen years due to an injury I received serving in the US military causing me to visit multiple physicians in the southeast for pain management treatment with little to no relief. To make matters worse, I was involved in an automobile accident in 2012 that caused me to have emergency surgery to correct the damage from the impact. I was left with three pins in my hip, and very few options. I went to a Chiropractor, had physical therapy, and continued to see the doctors I had always used. Several of the doctors I visited gave me a prescription for pain killing drugs. Admittedly, I took them because I was desperate for relief. The first time I visited Dr. Puppala I received a series of injections to the nerves in my back and hips. The pain subsided tremendously and today I feel that I am close to being pain free without pain killers. I need all of the energy and mobility that I can get right now because I have a house full of teenage boys to keep up with! Dr. Puppala and his staff are amazing and his treatments have made a huge difference in my life! I went to see Dr. Puppala today and entered his office with the use of a cane. I was in a lot of pain – it hurt to sit, stand, or walk. Previously, I had a consultation with an Orthopedic Surgeon who said I needed a hip replacement to eliminate the pain. I was pretty much ready to have it done until Dr. Puppala gave me the same hip injection that I received from the Orthopedic Surgeon and I actually walked out of his office without my cane! I am not 100% pain free but it is much better and Dr. Puppala did more for me in one visit than anyone has done in months. It is amazing and I don’t need surgery! In 2012 I was involved in a terrible car accident that left me with a broken neck, and severe damage to my right foot – as a result I have been taking pain medication for the last two years. Late last year, my son was part of a group tour at Dr. Puppala’s facility and discovered treatment options that had not been made known to me yet. I was anxious to stop taking medication but wanted a way to relieve my constant pain. Dr. Puppala changed my medication and began using a nerve stimulator on my back. I know that I will never be completely pain free but this combination relieves much of the discomfort. I am so glad that I found Dr. Puppala. Everyone in his office is very helpful and accommodating. There have been times when I needed to see Dr. Puppala as soon as possible and his staff always finds a way to work me in to the schedule. I had several injections in my back recently and they really helped to relieve the pain caused by a combination of advanced degenerative disk disease, and bulging, herniated disks. In a few weeks I will have nerve block injections. I’ve visited other physicians in the past but the pain never really went away and the office staff didn’t handle my case very well. A friend recommended Dr. Puppala – I am happy with his treatment plan and he is very personable. Of all the doctors I have visited he is the best! For years I have not been able to sleep on my left side. After Dr. Puppala performed a sacroiliac joint injection (SI), I can sleep on both sides and walk short distances without terrible pain. I went to visit Dr. Puppala. I was in so much pain. It started from my back, it went down my hip, down my leg, down to my toes. I could not walk, it was like I was like I was skating. My pain was worse than childbirth. Dr. Puppala determined that I had sciatica nerve irritation. He started me on the injections. His staff was so nice to me. One of the nurses held my hand while I had the injections. It has been wonderful. I am at zero pain right now. I could not have made it without him. He was excellent and I will tell anyone about him. I started going to see Dr. Vinaya Puppala about three months ago. Most all the doctors I’ve gone to in the past have been real jerks. My last doctor told me all my pain was in my head. Dr. Puppala wasn’t like that. He listened and determined what I needed. After he performed the treatment, I knew immediately that he had hit the spot. I have felt great ever since and have so much energy. Dr. Puppala and the group are just great. He’s a head above any other doctor I’ve ever been to. The main thing that Dr. Puppala has done for me is to make it where I can wake-up in the morning without pain and therefore no longer have the pain ruining my entire day. Before he started treating me, I could go to bed fine, but then I would wake up in severe pain and couldn’t get out of bed. I would stay in bed all day. Now I can go to bed knowing that I have the assurance that the next morning I’m going to wake up without pain. I can now function normally. Dr. Puppala is extremely pleasant, very professional. As his patient he treats more as a person, and he also seems sincerely concerned about me as a person and my life. I just think he’s a great, great doctor! I had surgery on my neck and they did a good job on my neck. However, it caused damage to my back. They were all focused on my neck. Since I’ve been working with Dr. Puppala I’m now able to function better in life. He has given me epidurals and prescribed pain medications. He’s always asking me questions and and coming up with treatments he can provide to make me feel better. He’s been able to help me feel better in my life. That’s a good doctor, he really is. I really enjoy going to him. I’ve made a lot of progress with my back because I’ve had a lot injuries and he’s made it to where I can cope from day to day. When I first started seeing Dr Puppala, I was in the bed, 7 days a week for 24 hours a day. I had to get my children to go get me food. All I could do was go to the bathroom and then back to bed. That’s about all I could do. Now, just 6 months later I’m up about 14 hours a day. I haven’t spent a day in the bed since then. I also had migraines and he put injections above my eye and it just worked wonders. It’s just awesome, Dr. Puppala has given me my life back. He also put an epidural in my back which has given me great relief. I was scheduled to have back surgery and because of his great care, I have been able to postpone it. He has been a lifeline to me. On my last visit with Dr. Puppala, I was asked my pain level on a scale of 0 to 10 and I said ZERO. I’ve had a lot of great days since my treatment and that never happened before. I feel like a different person! I’ve been coming to the pain clinic for about 2 years now. Since starting with pain specialist, Dr. Puppala, he has helped me more than any other pain doctor. I really thank everyone here for all the help then have given me. They all have been awesome! Thank you Dr. Puppala. No other doctor could figure out what I had. Dr. Puppala has really helped my pain and I don’t get as much any more. When I first came he diagnosed that I had shingles which he treated and I was cured. I am now getting injections for my arm and “oh yeah”, he has helped me a lot. He’s an awesome doctor and knows what he’s doing. He’s also very nice. I’ve been in two auto accidents and he has been able to get my pain to go down. It started in 2010 and I underwent different treatments. I had to have surgery which caused my muscles to get out of whack. I found Dr. Puppala and he listened to my concerns and then devised a plan of action. My pain was really bad and my vertebrae was pinching on the nerve. I started with a pain scale of 8 and 9 and now I’m down to 4. I tell everyone that I have a great doctor. He’s also helped me cut down on my pain medication.